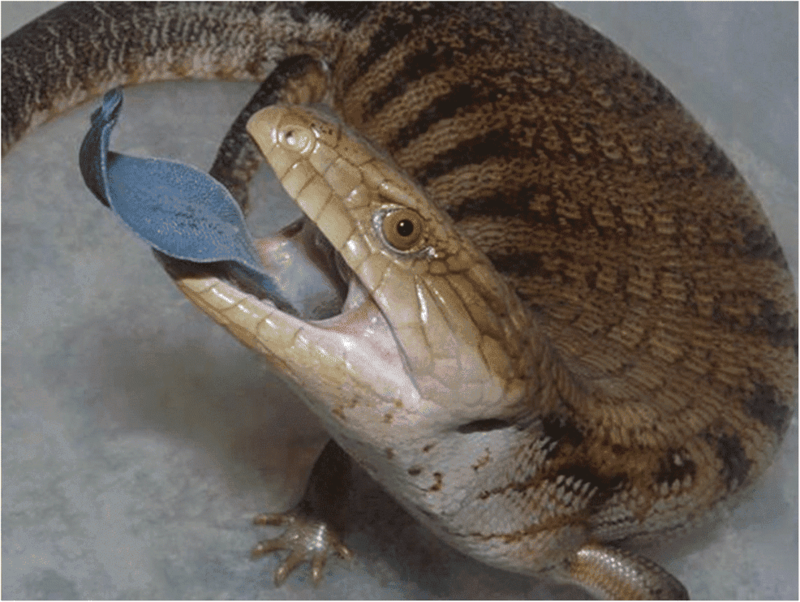 Australian skinks will literally stick their tongues out at predators -- and it works! Australian skinks will literally stick their tongues out at predators — and it works! When in doubt, stick your tongue out at them! Skinks in the genus Tiliqua are pretty inconspicuous as far as lizards go. They don’t really like to draw attention to themselves, and they’re decidedly lizard-shaped. New research shows that when their unassuming nature fails to garner the peace of mind they desire (from predators), the skinks fall back to a surprising — and surprisingly effective — last-ditch defense: their tongues. Bluetongued skinks are fairly widely spread throughout Australia, eastern Indonesia, and Papua New Guinea. They’re omnivorous, mediumly-sized lizards that primarily rely on their camouflage to keep out of sight. When under attack by a determined predator, however, they make an effort to stand out: the skinks open their mouth suddenly, as wide as they can, to reveal a brightly-colored blue tongue. Not to make them self-conscious but these tongues must be a sight to recoil from — because that’s exactly what predators do. The behavior is used as a last line of defense to protect the skinks from attack, writes Martin Whiting, the study’s corresponding author, in a press release. The research revealed that the tongues are very reflective in the UV spectrum, and that they are more UV-luminous towards the back. Some of the lizards’ main predators, such as birds, snakes, or monitor lizards, are thought to be able to see UV light, suggesting the skinks might use this light to startle predators into breaking off their attack. The study focused on the northern bluetongue skink (Tiliqua scincoides intermedia), the largest species of the group. The species sports good camouflage: broad brown bands across their backs to blend them into their surroundings. However, some of its main predators can still spot them, likely due to their ability to perceive UV light — so the team aimed to determine what tactics it uses to deter attackers. First, they used a portable spectrophotometer to measure the color and intensity across different areas of the tongues of 13 skinks. This revealed that the blue tongues actually reflect UV light. Further data crunching in the lab later revealed that the tongues were almost twice as bright at the rear compared to the tip. Mean spectra of different regions of the tongue. Associated illustration by Courtney Walcott of a Bluetongue skink performing a full-tongue display. Image credits A. Badiane et al., 2018, Behavioral Ecology and Sociobiology. The next part of the study was to identify how this bright tongue benefited the skinks. The team observed that skinks in the wild would open their mouths and stick their tongues out at would-be attackers. To find out more, the team simulated attacks on the lizards using models of their natural predators — the team used a snake, a bird, a goanna (monitor lizard), a fox — and a piece of wood as a control. Skinks will rely on concealment for as long as they possibly can, the team reports. Should this fail, however, the lizards open their mouths widely at the last moment, revealing their UV-reflective tongues. One particularly amusing paragraph of the study suggests that the more intense attacks elicited a stronger tongue-response: the more risk the skinks felt exposed to, the more tongue they would poke at their enemies. I can relate to their fighting style. 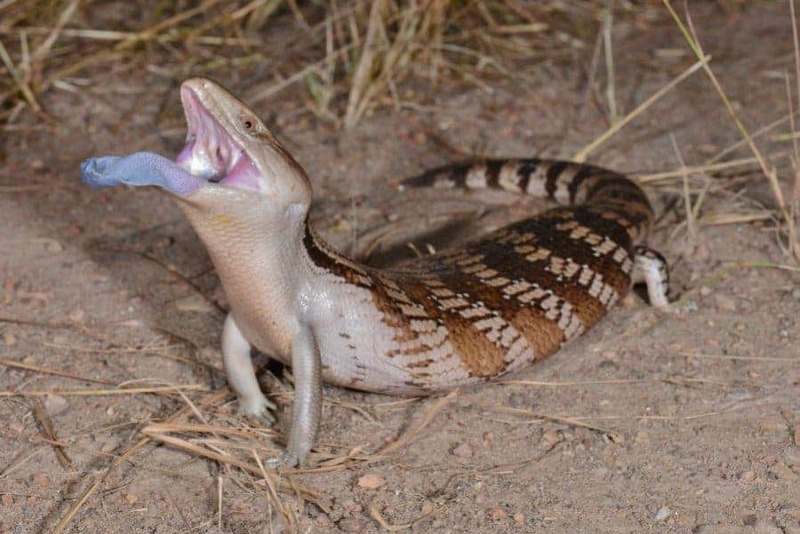 Northern Bluetongue skink performing a ‘full-tongue’ display in response to a simulated attack by a model predator. The face of a true warrior. Image credits Peter Street / A. Badiane et al., 2018, Behavioral Ecology and Sociobiology. “The lizards restrict the use of full-tongue displays to the final stages of a predation sequence when they are most at risk, and do so in concert with aggressive defensive behaviours that amplify the display, such as hissing or inflating their bodies,” explains lead author Arnaud Badiane. 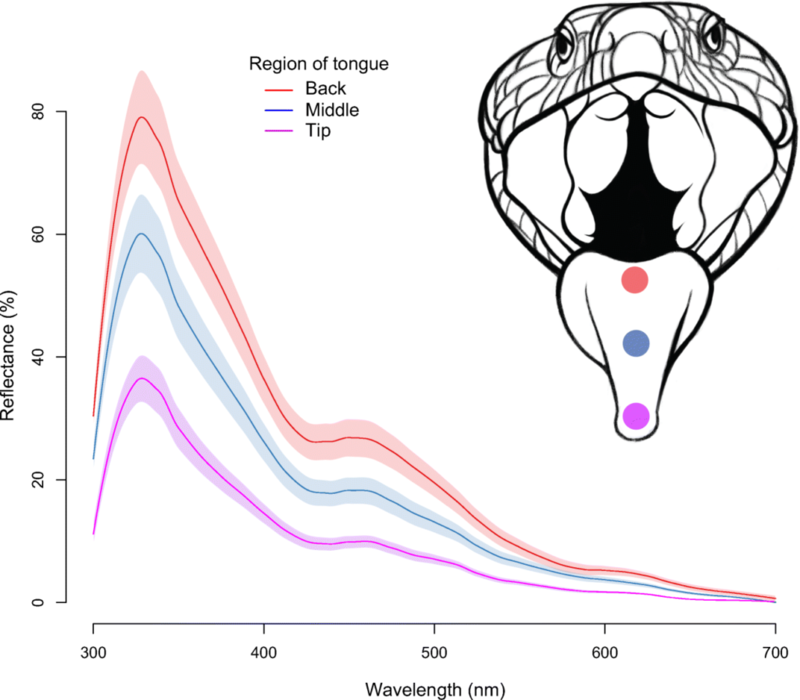 Finally, the team notes that tongue-displays were most often triggered by the fake bird and fox models, rather than by those of snakes or monitor lizards. If you’re ever caught between a rock and a hard knuckle, stick your tongue out. It likely won’t be as effective as those of the skinks, but maybe you’ll confuse people enough to make your (brave and honorable) escape. Worth a shot. The paper “Why blue tongue? A potential UV-based deimatic display in a lizard” has been published in the journal Behavioral Ecology and Sociobiology.